Manchester United are tracking the situation of Daniel Sturridge and could be prepared to launch an incredible move for the Chelsea striker. 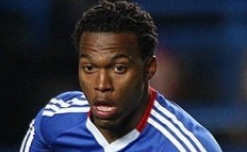 Sturridge's future appears increasingly likely to be away from Stamford Bridge as the Blues embark on a summer of heavy spending, particularly in the forward department. One source has claimed United boss Sir Alex Ferguson is a keen admirer of the 21-year-old and sees him as the future of the England attack along with Danny Welbeck.The England under-21 star has made it clear he is unwilling to sit on the bench all season and is prepared to leave Chelsea in search of regular football. Some reports claim Chelsea have placed a £20m valuation on Sturridge in a bid to ward off other clubs but he will be ready to force a move if first team chances are scarce.